Rethink Robotics is giving researchers an ability to get up close and personal with its Baxter industrial robot, with a new research version they can use to build custom software and applications for the robot.The Baxter Research Robot — a two-armed humanoid robot much like its commercial counterpart and with the same $22,000 price tag — includes a software development kit designed for ROS, the Robot Operating System standard on which Baxter runs. Of course, many researchers will be manufacturing engineering teams at large manufacturers. We’re ultimately hoping our introduction of an open hardware platform will result in big ideas in terms of software applications and end effectors, much like software did for computers and apps for smartphones. The possibilities are limitless. The hardware for the research version of Baxter is exactly the same on both versions of the robot; the only difference is in the software that is installed, Rosenberg told us. 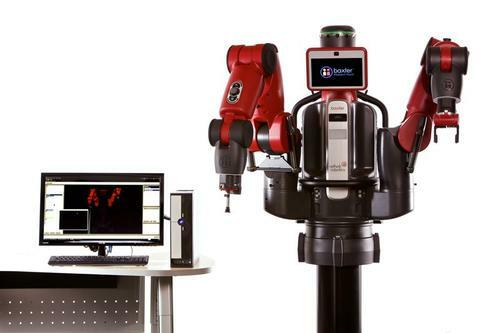 While the manufacturing version of Baxter is pre-programmed for training in industrial work, the research version comes with the SDK, giving developers a blank canvas to program the robot. Developers can communicate with Baxter’s development workstation via an Ethernet connection and a network address, Rosenberg said. Researchers at MIT and Tufts, among others, are already working with the Baxter Research Robot. Rethink Robotics unveiled Baxter last year and positioned the robot as a major step forward for industrial robot design. Key to Baxter’s design is its more humanoid appearance and ability to work safely alongside humans on the factory floor by sensing its environment through built-in software and sensors. The robot also is easy to train, so it can take on an assortment of tasks. Traditionally, industrial robots have looked more machine-like, often have to be caged off to protect human workers from any possible malfunction, and are programmed to perform one specific function.